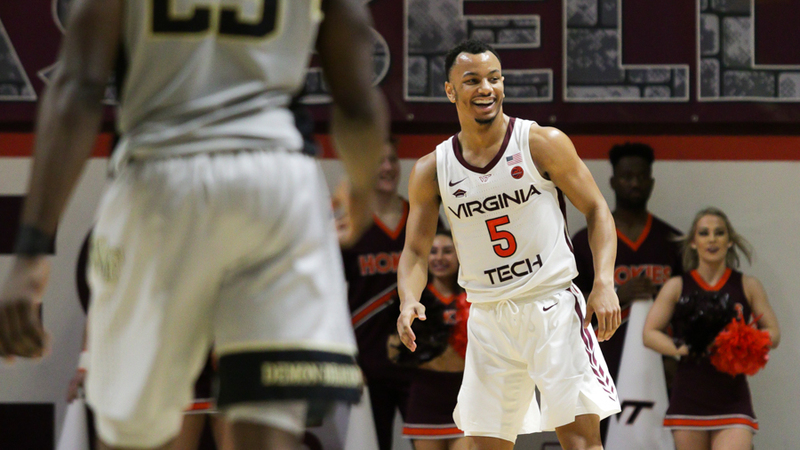 The Hokies hammered the Demon Deacons, 87-71. Then the towel came out. More frames on the hang than jump. The officiating ... was not great. Bede is French for "triple". Mean mug status: near LeDayan. That's what I was thinking. I was surprised he didn't get a technical for being on the floor with the play that close. They needed a third ref. He was just trying to help out. nah, the player double dribbled because he thought he was going to run into Buzz so he half picked up his dribble. If Buzz isn't on the court, it doesn't happen. Buzz is telling the ref that WF player double dribbled. Then Wilkins steals it..... So its still a turnover. I kept expecting Buzz to get in trouble during the game. But I guess the one ref was making up enough fouls without having to call them on Buzz. Buzz is right, that's a blatant travel. The Wake kid threw that terrible pass out of respect for the game. Kinda surprised those two uniforms were ok'ed honestly. White and light gray? Would have thought we would see one team go darker. I thought that too. The pregame graphic said we were wearing gray so I assume Wake surprised us. I can't watch this without hearing 23 say in his best Forest Gump voice, "SOMETHIN' BIT ME!"